This splendid shaft, the oldest ecclesiastical monument of Nottinghamshire now standing, is said to have been placed in its present position at a cross road in 1760. Previous to that it was lying in the churchyard, perhaps nearer to its original site. The square base on which it now stands was re-constructed in 1820, when the square cap, surmounted by a ball, was added to the shaft. It appears as a cylindrical shaft, about 10 ft. high, but is CROSS more accurately described as square, with rounded faces tapering to a square at the top, from which the cross head probably sprang. The diameter of the shaft at the base is about 2ft. it has three bands of surface sculpture, divided by horizontal lines. The two lower portions are covered with interlaced ornament of continuous scrolls, more or less showing a change of pattern on each of the flattened sides. The central band especially is of wonderful intricacy of lines alternately forming the diameter and circumference of the pattern with which the surface is covered. The upper part, where the shaft becomes square, is much worn, except on one face, which has upon it a symbolical birdlike figure with wings trampling upon a serpent. Close observation reveals the head to be that of an ox with horns, probably the emblem of St. Luke. The other faces may have borne the emblems of the other Evangelists. Dr. G. P. Browne, now Bishop of Bristol, was the first to point out the meaning of the figure, and he suggests, as an interesting corroboration, that Stapleford feast is governed by St. Luke’s day, or rather “old St. Luke’s,” which corresponds to our October 30th. “Feast Sunday is the last Sunday in October, unless that be the last day, and then it is the last but one;” this is the rule still recognised by Stapleford inhabitants. Of course the feast Sunday could not be on October 31st, for then the week could not include old St. Luke’s day. (The Conversion of the Heptarchy. Browne. S.P.C.K.). The church is dedicated to St. Helen, but we have, no doubt, in this cross, the record of a still older dedication of the locality by the earliest Christian teachers in these parts. Stapleford Cross has been moved into the churchyard for its own protection (A Nicholson, 2002). Two questions of interest arise in connection with this monument. Whence came the art with which these wonderfully intricate scroll-work patterns are produced? 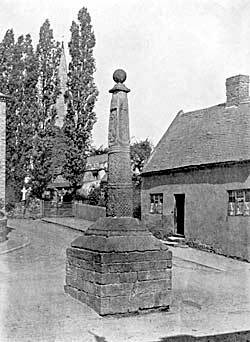 What is the probable date of the Stapleford cross? The earliest Anglian example of the scroll-work is without doubt to be found on the great cross at Bewcastle, which from its inscriptions can be dated 670. This is earlier than any of the Irish work, which is usually described as the original source of the art. Following Bishop Browne, I think we must look to the influence of Byzantine art, through Lombardy, where similar work is found, brought perhaps to this country by Wilfrith and Biscop, as giving the impulse which produced the Lindisfarne school of ornament, the interlacement of continuous flowing bands, so especially developed as an Anglian characteristic, both in manuscript and masonry. 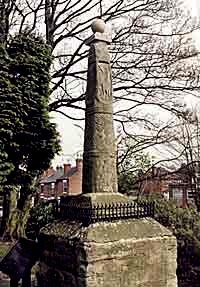 The latter half of the 7th century saw the conversion of the kingdom of Mercia to Christianity, after the death of the stout old heathen, Penda, through the influence of the Northumbrian, Oswy, and his son, Alchfrith, who is commemorated on the Bewcastle cross, and of the saintly Chad, Bishop of Lichfield, The 8th century saw its rise to supremacy among the kingdoms of the Heptarchy. Nottinghamshire, as a borderland between two great kingdoms, must have often felt the tide of conquest swaying this way and that, and the erection of a great cross close to the stream, which marks the county boundary, may have had a civil as well as an ecclesiastical significance. The village, as Mr. W. Stevenson has suggested, derives its name of Staple-ford from the tall shaft (A.S. Stepel, whence our word steeple, or stapol, a prop or post), which, from the style of its ornamentation and the circumstances of the times, was probably erected between A.D. 680 and 780.